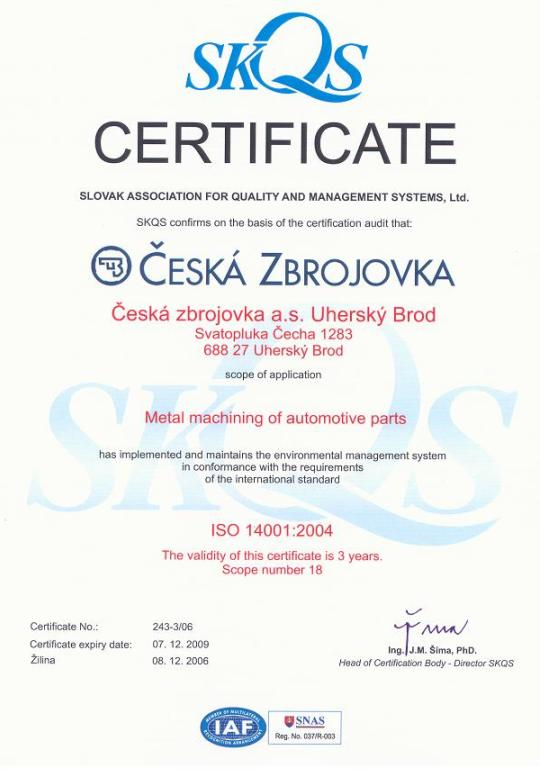 Ceska zbrojovka a.s., Uhersky Brod is a long standing manufacturer of small arms. The original orientation of the company was to produce military small arms, but over time the product range was expanded with products for civilian use both for sports and hunt shooting. 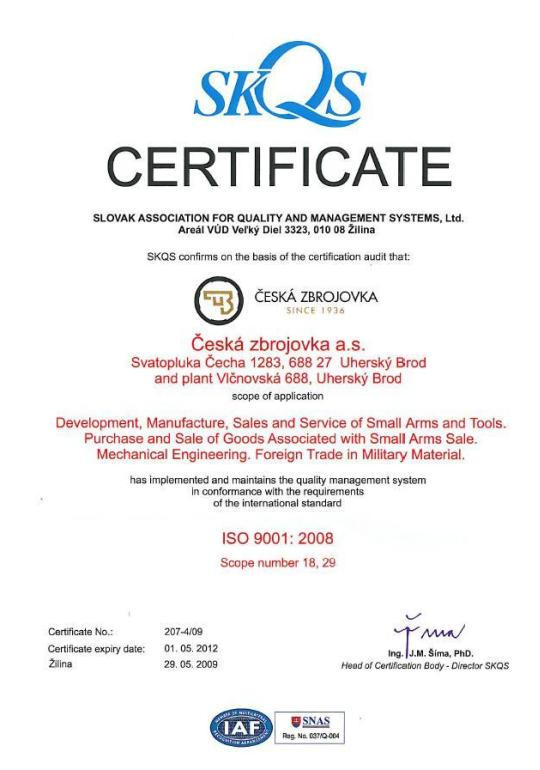 Ceska Zbrojovka permanently increases the volume of its production, while expanding its assortment of small arms - both individual product types and modifications. 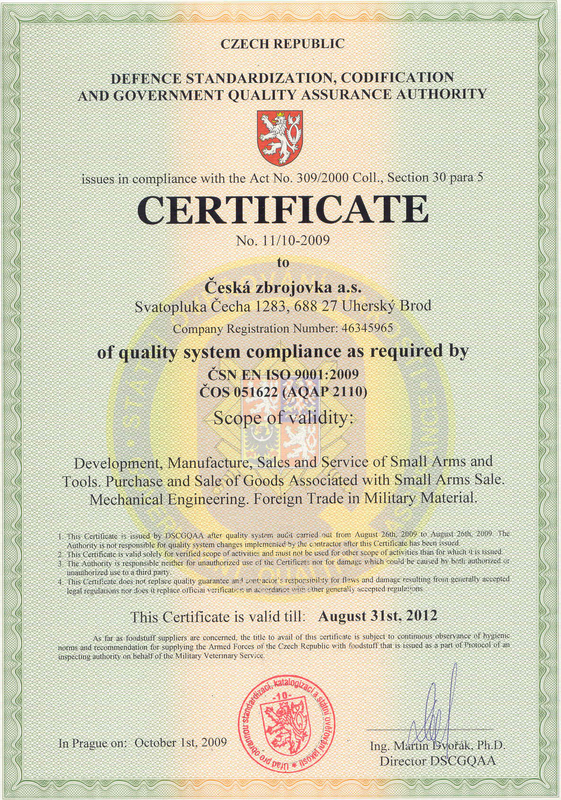 The prominent feature of firearms made by Ceska Zbrojovka is their quality, long-run reliability and accuracy. These features bring a lasting interest to the purchase and use of these products. 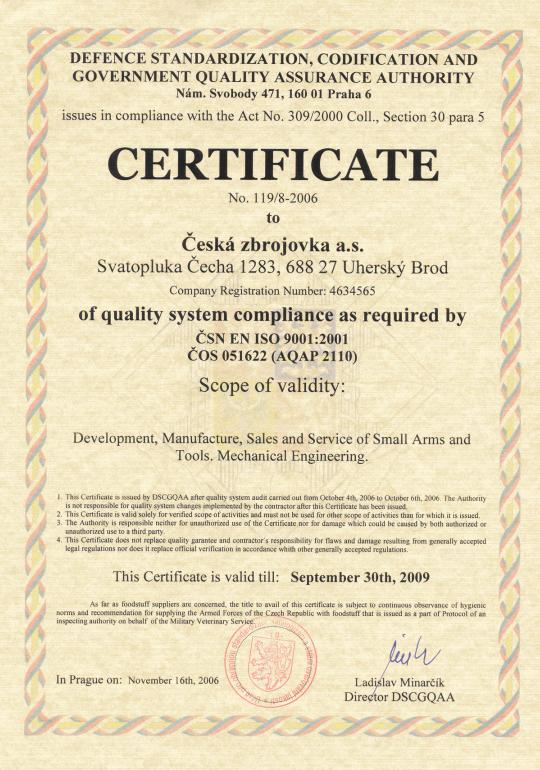 At present, Ceska Zbrojovka represents one of the biggest small arms producers in the world, based on sales to about 100 countries around the world. 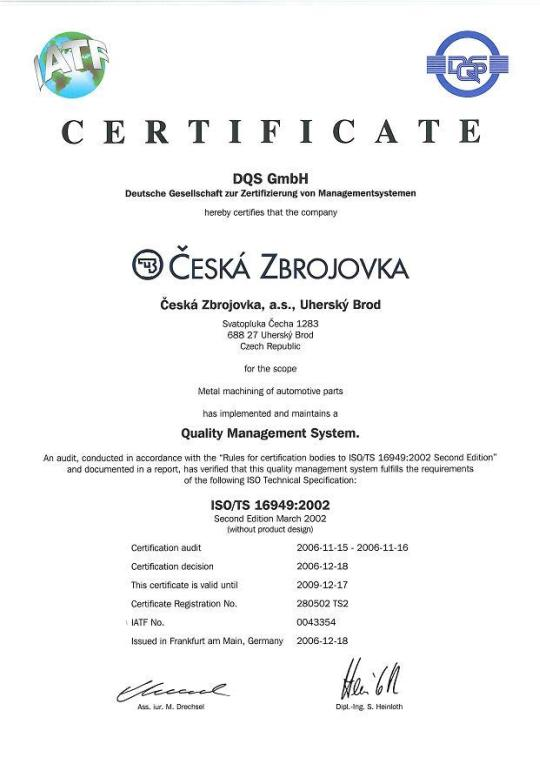 The excellence of Ceska zbrojovka's products have created an image of high quality over the span of its existence both on the domestic and world markets; for this reason, the company considers its responsibility to be to ensure that the parameters of its products will be the best possible at all times. The company's technical development and production of pistols, rifles, rimfire rifles, shotguns, and air guns constantly create a wide assortment of products. Armed Forces Customer Support Dept. Semi-automatic pistols of the CZ brand combine unrivalled tradition of the Czech firearms industry with the state-of-the-art designs and technological processes. Česká zbrojovka now developed a series of highly innovative models based on the legendary CZ 75 model, which completely redefined duty and defence pistols category. The latest models include the CZ 75 D COMPACT, which was used for the rearmament of the Czech Republic Police, further CZ 2075 RAMI subcompacts, or the CZ 75 SP- 01 family, from which comes the handgun of the double World Champion in shooting according to the rules of IPSC Production Division, Mr. Adam Tyc. The CZ 805 BREN A1 features a unified and modular weapon system manufactured in 5,56x45 mm NATO and 7,62x39 mm calibres (with the prospective introduction of the 8x43 mm SPC Rem), which has been designed as personal weapon for any combat branch. From the functioning point of view, this is a gas operated automatic weapon with locked breech having rotary breech block,. Its modular concept and the unified system of interchangeable barrels attachment, using exchangeable breech block and gas tube, allows easy and quick conversion to a different calibre. The design of interchangeable magazine well enables utilisation of the standard M-16 magazines implemented by NATO, including high-capacity magazines for company automatic weapons. All the barrels have been adapted to accommodate fitting of the flash suppressor and silencer.The unified, easily detachable trigger mechanism has been provided with the four-position firing mode selector (0 – 1 – 2 – continuous bursts). The CZ SCORPION EVO 3 A1 submachine gun in cal. 9x19 is all-purpose, light automatic small arm of the PDW category. This weapon allows shooting to be conducted in bursts, limited bursts and in single shots. In the standard version this SMG is equipped with a folding stock enabling shooting from the shoulder. The weapon can be shot from free hand when the folding stock is retracted. The effective range of fire from shoulder is up to 250 m distances, from hand up to 50 m. When the last cartridge from the magazine has been shot the bolt remains locked-open. No tools are necessary for routine maintenance disassembly. Low weight and small dimensions facilitate concealed carry and use in a very constraint spaces. Characteristic features of this weapon are a good balance making quick and easy aiming, high accuracy of fire, long service life a high functional reliability under various combat conditions. The relevant advantage is in ambidextrous controls and multiple rails as per MIL-STD-1913. This submachine gun comes in a plastic case. The package includes two double-column magazines with 30 cartridge capacity, sling, and cleaning kit. On a special order the weapon can be supplied with accessories such as sound moderator, 20-shot magazines, several models of torches incl. quick attachment clampings, laser designators, tactical handles or red dot sights and other optics. The Model 58 Assault Rifle is an individual weapon for all kinds of armed forces. It is an automatic, light small arm in cal. 7,62x39mm, allowing the fire to be conducted either in bursts or semi-automatic mode. This model is a personal weapon for members of special units, members of tankcorps and aircrews, commanders of all levels and for police units. The CZ 750 S1 M1 is basic heavy version designed for solving all sniper missions primarily in unenclosed ground. In order to facilitate a more accurate fire the weapon comes with bipod and mirage deflector preventing any mirage above shot heated barrel. The CZ 750 S1 M2 is compact and short version suitable for use in constrained spaces and residential areas having detachable sound suppressor, primarily designed for combat with enemy snipers. In order to facilitate a more accurate fire the weapon comes with bipod. Since 2005 the part of Česká zbrojovka a.s. portfolio is formed also by handguns made by the renowned Dan Wesson company, the brand that is synonymous with quality, excellent fit and finish and accuracy. Thanks to the new manufacturing facilities and cutting-edge technological processes the factory of Dan Wesson Firearms Norwich in the State of New York produces today for Česká zbrojovka a.s. and its subsidiary company CZ-USA one of the best duty, defence and sports pistols of the M1911 series in the world while maintaining a very favourable final price. The rimfire rifles of the CZ brand are superior, highly modern firearms perfectly prepared for hunting, sport, training in shooting skills and leisure time activities. The current selection includes the CZ 452-2E ZKM line of rimfire rifles and follow-up models designated as the CZ 453 and CZ 513 FARMER. All these models feature a typical, original and simple bolt, maximally safe trigger mechanism designed for the trigger pull adjustments, excellent accuracy to which a significant contribution is provided by the hammer forged barrel complemented by overall durability and robustness bordering on indestructibility. Over/unders made in various configurations such as shotgun-shotgun, shotgun-rifle and rifle-rifle of the BO 800 series and the BRNO EFFECT break-action single shot rifle are the latest followers of long and glorious tradition of modern hunting and sport weapons production in the Moravian metropolis named Brno. 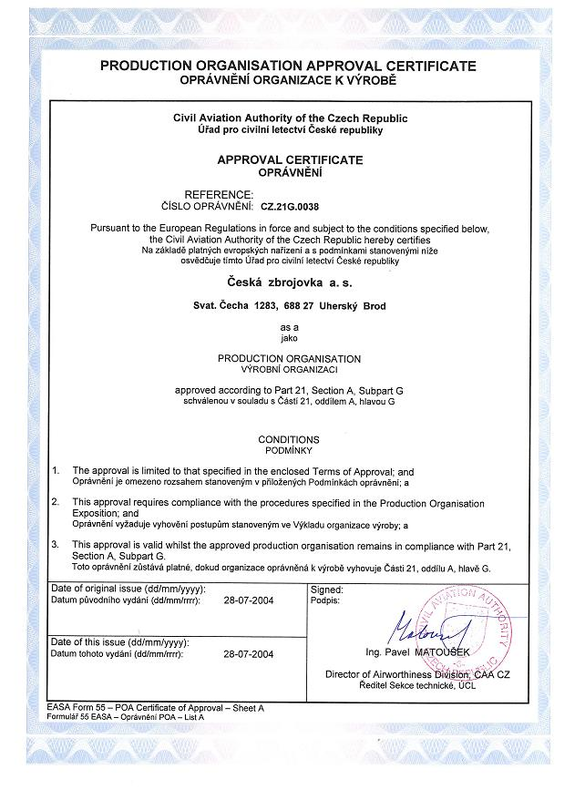 Since 2006 the production of these firearms was taken over by the BRNO RIFLES, s.r.o. 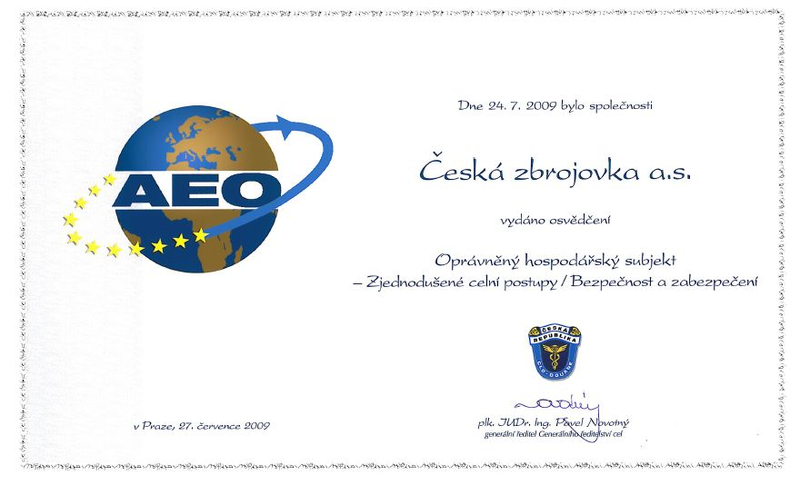 company, which is a subsidiary of Česká zbrojovka a.s. Now the team of the most experienced former Zbrojovka Brno employees with the use of the state of the art CNC machines continues in production of the most advanced products which are perfected in their construction and design, and bear Z in helix mark.